Recently in Washington, I decided to go to the National Cathedral. I've been to countless Evensongs, and some Compline; I've wandered about, usually ending up in the bookstore, where I would satisfy my blood lust for anything liturgical. I had never been to a Eucharist, however, so this was the time to experience that. When a friend and colleague, who happens to be Mormon, heard that I would be attending, he wanted to come along. "I understand that they have this service where they bring in all the flags of the states." He further explained that when he called the cathedral about this particular service, all he heard about was "this Eucharist". "What is the Eucharist?" he finally asked. 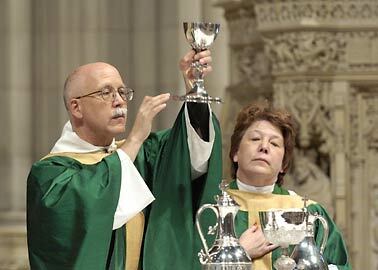 Another colleague asked, "This National Cathedral ­ is it Catholic or what?" And there you have it. The notion of a National Cathedral seems rather odd when you think of the religious pluralism of this United States. At one point, the Presbyterians got a lot of press about a "National Church" somewhere out on Wisconsin Avenue, but the idea doesn't translate as well. The question still remains, however. 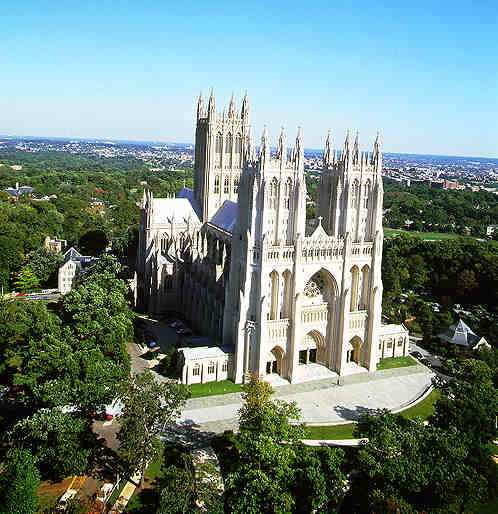 Why a "national cathedral"? In other times and places I have written about the genius of Episcopal cathedrals. When they work, they indeed do sit at the center of a community, becoming a place not only of worship, but also of dialogue, discernment, and discovery for entire communities ­ so why not a nation. It was understandable that my Mormon friend would think that there would be a liturgy that would revolve around the symbols of the national states. The National Cathedral is pretentious. I mean that in a good way, although I am certain that there are others who do not see the pretensions of the cathedral in a good light. The English cathedral is an expression of the Established Church, so one wonders if the American counterpart doesn't carry a bit of that weight and import. The pretensions that I see are that a place and the community that thinks, works, writes, speaks, paints, sings, and so on in that place do seriously think that they can affect the society in general. And this is what is honorable about this tradition and practice. The cathedral, especially this cathedral, is designed to engage the nation, just as its diocesan cousins are designed to engage metropolitan communities. The pretense is that there can be a dialogue of religion and society within a given place. This is indeed an American place. From the tomb of Woodrow Wilson, to the moon rock encased in a clerestory window, to the flags of all the states hanging in the transepts (there they are, Kent!) we are clearly aware that this is a national place. It is the seat of many national ceremonies. Hopefully it is also the locus of many national debates. Meanwhile, back at Mt. Saint Alban's, I am getting out of my cab and walking into the Cathedral Church of Ss. Peter and Paul, its real name. There is the quiet din of the tourists who have come to see what there is to see, and there are the parents and friends of some choir from the area that is offering a prelude to the service. There is a great quietness in the center ­ walking up the aisle to the seats gathered at the crossing, I see the faithful gathered to celebrate the liturgy. And gathered around them are a lot of people doing stuff. Vergers are wandering around placing things, locating things; acolytes, altar guild members, and assistants of various types make certain that all is ready for the service. Ushers vainly attempt to seat people, and to direct other people to not use their cameras ­ but we are an unruly nation, antinomian. One is tempted to think that the entire congregation, or at least the over-whelming majority are visitors, and yet the ushers greet some warmly and knowingly. Clearly it is a mixed audience ­ what is this Eucharist? And when the choir is finished with their prelude, a goodly number of the parents and friends of the singers get up and leave. The celebrant comes to the center of the altar to welcome us to the liturgy, and to make certain that we understand that this celebration is open to all. That is one way to deal with pluralism ­ invite everyone to the party, and allow them to partake of the food and drink that is offered. There is something vaguely familiar about the man who will celebrate the Holy Mysteries, but I cannot place him, until after his greeting. I check my program, and there it is. He is Michael Wyatt, Canon Director of the Center for Theology. I'm heartened that it is an old friend from San Francisco, whom I have probably not seen for some fifteen years. I am even more heartened that he has the job that he has ­ theology and the public space. As a Lutheran, I used to hear the joke about the Archbishop of Canterbury being asked, "What is it that you Anglicans believe?" To which he replied, "Well we believe... that if you don't believe... you go to hell... as it were!" And so much for Anglican theology! But where does one go for Anglican or Episcopal theology? Where does one go for Lutheran theology? In the Lutheran environment, one clearly needs to go to the high towers of academia to locate theologians. Parish pastors were never encouraged to be such, and Lutheran bishops are too young to aim so high ­ at least publicly. Anglicans certainly have theologians in the academic sphere, but now I am thinking of people like Michael Wyatt, or bishops like James Pike, or John Spong, or parishes like Trinity, Wall Street, or deans like Allen Jones. These people are closer to the front lines, I think. It is "low Sunday", the Sunday after Easter. One is tempted to think that the "low" refers to the attendance on the Sunday after Easter, but really it is about being the Octave of Easter, for Easter is many Sundays of Easter. The music and ceremony is triumphant. Other places do it better, but I think that the Canons of the cathedral understand their audience. The congregation that is gathered for the Eucharist exhibits few signs of the cross, or the manual gestures at the Gospel, or bowings during the Creed, or at the Sanctus. There are only two lessons (Epistle ­ using the first lessons from Acts, and the Gospel). There is a procession of the gifts, but the elements of the communion are brought up right away ­ unceremoniously. The bulletin announces that the national church group being remembered today is the Southern Baptist Convention, but the deacon fails to utter one bid for them. The intent is good, however. This cathedral is looking in many directions, and welcoming all of them. (There's coffee in the Rare Book Library). Over all, the liturgy ranks a 6 or 7 on my Notre Dame scale (see note below). What strikes me is that this cathedral is on the front lines of the church. 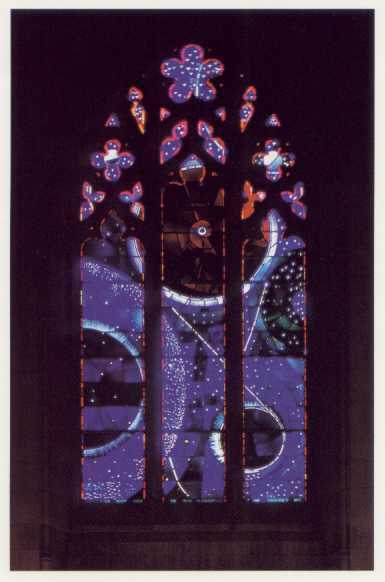 I have thought of cathedrals in the past as those wonderful dark places where we go to connect with the sacred. It always seems to be not a place for initiates, but rather a holy place for those who know. (Grace Cathedral's whole catechetical program makes mincemeat of this idea). This cathedral, like several others, reaches out, trusting in a way the American dream, and the Statue of Liberty's sentiment, "Bring me your tired, your poor, your huddled masses" One wonders what happens in the minds of those who visit, not truly knowing where they are. One wonders if the message gets across, if there is an actual dialogue between Christianities, or with the practitioners of other religious traditions. Or is it only a curiosity? I don't stay for coffee; I have obligations back at the Omni Shoreham hotel. 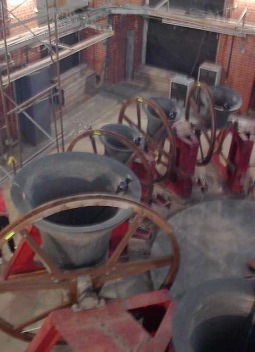 As I leave, and as I walk through the Cleveland Park neighborhood that surrounds the cathedral, the bell tower beings to sound with changes, the bells going over their assigned pitches and timbre over and over and over again. I wonder what the neighbors think? It is, however, inviting and calming ­ a presence that stays with me as I descend the hill, returning to the world that this cathedral has hopefully addressed.